Fri., July 21, 2017, 7:47 p.m.
SOUTHPORT, England – Jordan Spieth expected a rough time at the British Open before he even got to the golf course. He spent Friday morning at his rented house in front of the television, watching players battle a relentless wind at Royal Birkdale, all the while checking a forecast that was even worse for when he played in the afternoon. “It wasn’t a great feeling knowing we were coming into something harder than what we were watching,” he said. Spieth did more than just survive. With a short game as sharp as it has been all year, and a 3-wood that turned out a lot better than it looked and led to an eagle, Spieth seized control with a 1-under 69 that gave him a two-shot lead over Matt Kuchar going into the weekend. Spieth turned a bogey or worse into an unlikely par by chipping in from just short of the 10th green. And he learned enough from watching TV to know that going a little long on the par-5 15th would give him a better birdie chance than playing short. So he switched from a 3-iron to a 3-wood, hit it a little off the neck and watched it run hot and fast some 100 yards along the wet turf to about 18 feet away. The flight of that 3-wood looked as ugly as the weather. The outcome was as bright as his chances of getting his name on another major championship trophy. The key to his round came in the middle, starting with a 10-foot par putt on No. 8 after he drove into a pot bunker. The biggest break came at No. 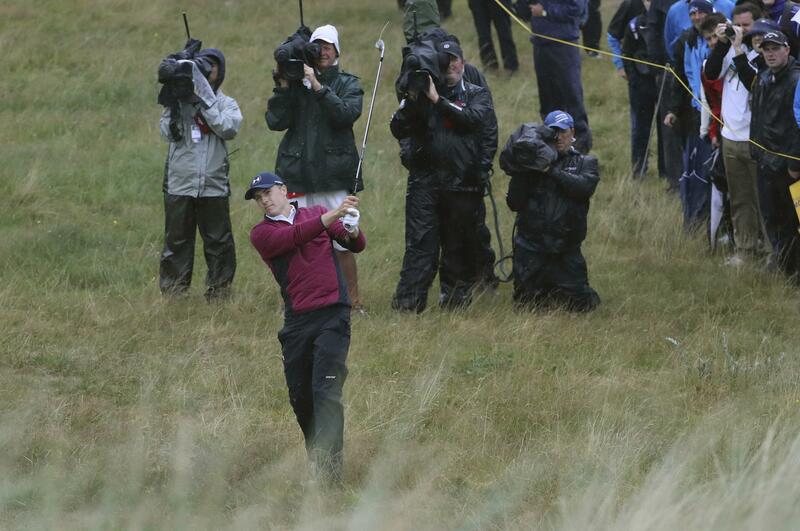 10, when the rain was pounding Royal Birkdale. Spieth hit into another pot bunker off the tee, could only advance it out sideways, and came up short of the green in light rough. And much like Spieth, he kept his round together with crucial par saves early on the back nine when the wind was at its worse. McIlroy posted a 68 and was at 1-under 139, only five shots behind with only five players in front of him. Published: July 21, 2017, 7:47 p.m.